Timing (or ‘life’) often plays in our decisions. When I received this guest post invitation (Thank You Michele! ), I happened to be converting my storage system for my fabric stash & offering Stash-busting pattern ideas as my free Block of the Month on my site Victoriana Quilt Designs. Collecting fabric for a stash and interest in how to store it are two things I know we have in common, so that made it a good topic for me to write about. Converting my collection of fabric involves moving them into clear stackable plastic containers from many cardboard boxes. Though I’ve always stored my fabrics by general colours (green, blue, etc.) and upcoming designs I’m collecting for, I also took this opportunity to sort the colours further into common like ‘families’ of fabrics (moss green, dark green, light greens, green-blue, etc. ), which makes it even easier to find the fabrics I need. The investment in these 16.1″ x 11.1″ x 5.9″ (40.9cm x 28.2cm x 15.0cm) containers has been such a treat to myself and I love my new fabric stash storage system. As a special note: All my new fabrics are washed before they get added to the collection. There are good reasons for this (dye running & shrinkage), but I mostly do it for removal of the chemicals fabric companies use. I don’t want to risk my health. When you press unwashed fabric the steam travels the chemicals into your breathing zone. Please be careful…I learnt about this from a fellow quilter who got very ill for this reason. 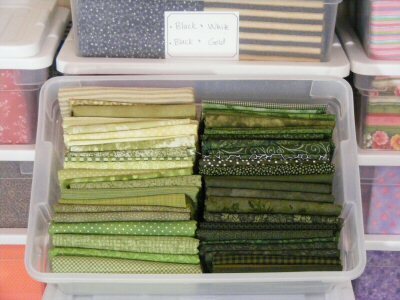 The folding of the fabric into relatively uniform size is important, but since I am not stacking them, they can vary in width and thickness, so I am able to store all yardage up to 2 yards in these containers, by folding them into approximately 6″ wide by 5 1/2″ high. [Fabric nicely folds into these measurements, and I would recommend finding containers that fit this folded size, if possible.] I do not press my fabrics until I’m using them, so there is no need to keep yardage large and flat. Fold the fabric selvage to selvage. Fold again, taking the fold to selvage. This makes your 44″/45″ wide fabric into about 11″ wide. Beginning at one raw-edged end, fold the fabric over about 6″ (you can use a ruler until you are comfortable eyeing it). Keep folding this section over and over until you reach the other end. Tuck any extra into the bundle. This bundle of fabric is now approximately 6″ wide by 11″ high. Fold it in half to make it 6″ wide by 5 1/2″ high. Place in the container with the folded edge up. Fold the fabric raw-edge to selvage. This makes it about 11″ wide. Beginning at one raw-edged end, fold the fabric over about 6″. And then fold it again. This thinner bundle of fabric is now approximately 6″ wide by 11″ high. Fold it in half to make it 6″ wide by 5 1/2″ high, as you do with the larger yardage. Fold into approximately 6″ wide by 5 1/2″ high. This method allows me to see the fabrics quite well. The folds show a portion of the design, as the edge of bolts in fabric stores shows enough to make us curious. Note about my smallest scraps: I keep these in several different sized baskets, including one for under an inch scraps and threads, which I keep to fill pillows for our cats. If you make a lot of scrap quilts you can cut your smaller scraps into squares, bricks or strips, that you will use for a scrappy quilt you wish to make. I label each container with the names of colours that are contained within, and this label helps me further decide if a container could have what I’m looking for. So now, instead of forever moving and opening boxes in my hunt for a fabric, I find the stack the fabric would be in, take out the container(s) that most likely have what I’m looking for and even before I open the lid I can scan the clear bottom and sides. I made up my labels into a pdf file that you request, hoping it will be as useful to you in your fabric storage system. I would love to hear about any tips you have from your system, so please share them in the comments! Wow Benita…that is really awesome. I’ve been working on organizing my stash too. I finally found ways to fold FQs and yards that makes them fit nicely on my shelves and in bins. It was fun going through my stash and refolding stuff. I got to meet some old “friends”. Thank you for your wonderful suggestions. Benita your stash looks great. I’m not even going to attempt to do that. I’d go mad. I’m just not the neatest person; looks great but I’d mess it up by the time I made 3 quilts. I loved reading about your system and how you organized it is amazing. Especially the fact that the containers are small and manageable. Great job Benita!!! I also have my stash in plastic containers stacked on shelves but they are much larger making them heavy and unwieldy. It looks like two of the containers you use would equal one of mine. Where do you find containers in the size you use? I don’t think I’ve seen that size in the stores around here. Thank you for the info on how you fold your fabric. Watch out stash, here I come! Your stash looks great! I now have a room & mine are on shelves on the wall by color or “topic” – frogs, strawberries, candy, etc. My next project involves putting shelves in the closet, so I can get that area organized and easy to get to. Wow! You’ve been as busy as I’ve been!!! I just, today, finished reorganizing my fabric stash of 15 years. I’m a crafter that sells at craftshows and also a quilter and teaching my granddaughter to quilt. So my room is usually pretty messy and you can’t even walk in it by the end of the year, as I tend not to put things away when cramming for the shows…so the first couple months of the year is spent cleaning everything up. I’m lucky, I have a walk in closet that has all shelving and that’s where I keep my fabrics. Today I finished re-doing it. Wish I could send pics but don’t know how on this site…don’t see where you can attach pics. I organize by topic and also by color. I got rid of a ton of scraps this last couple of months by grabbing a pattern and cutting it out and putting it in a ziplock…cut out 60 quilts and all are different patterns and cut into the kits and inbetween everything else, I grab one and do it really quickly this way. Lots are going to be donation quilts and some I will sell and some I will keep. I like your BOM’s you are doing…I use those too for getting rid of scraps. Thanks for all you do and keep doing it. I also enjoy your site very much. storage bins for my yarn. Thanks for sharing this with us Benita. This has been fun reading all of your ideas! I do like to keep my fabric fairly organized which allows for less ‘looking’ time when I design (I found the fabrics I wanted to use for my new Stuffies series in less than half the time it used to take me)….and I enjoyed listening to audio books while I re-organized. The brand of container I used is Rubbermaid, which was available at my local hardware store, so I don’t think it should be hard to find. They were quite happy to order these in bulk for me. The approximate measurements and stackability is what’s important. A container that holds a third row of fabric, but is only about 6″-7″ high would also be useful. MaryLou…I agree about the visiting old friends. The new sorting actually sparked a new design I have coming up. Vicki…We can’t add your pictures here, but I would love to add them to my Quilty Stories page on my site…If you want to email them to me. Scott…You can fold fabric anyway…hehe…but folding it all the same way makes them match up better. Tell your wife she’s lucky you collect your ‘pallet of creativitiy’. It could be tools or electronic toys, assuming you don’t also collect those. I like the hanging shoe storage idea, Patricia! 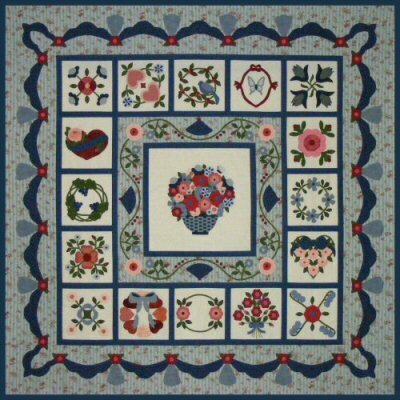 Benita…I posted alittle more and the pictures on the Quilting Stories on your website…thank you for giving me the opportunity to do so. Between us, I think anyone can get organized, don’t you think? Also, downloaded March’s BOM…more scrap use, thank you! I just find Benita and her designs so refreshing and she has definitely helped bring quilting into the the 21st century. Please keep inspiring us all!!!! Thank you for posting the story and pics…have a great vacation! I have been folding my fabric somewhat differently and using the same size Rubbermaid containers for years. I will be trying the folding method you use. 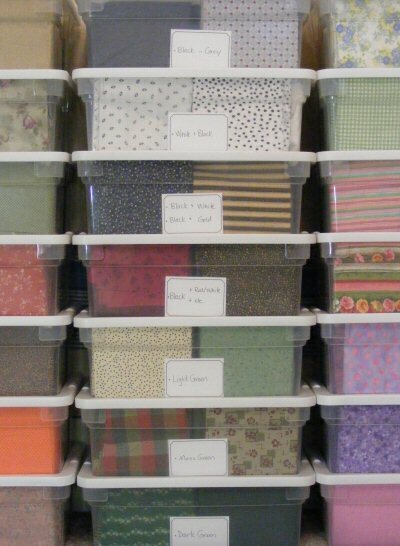 I fold my FQ using the 3″ ruler and the next size smaller bins and find that works well for me. Mind you, I have no stash in comparison to yours. Wow, you’re so organised! I like to do quilts with my aunt but it’s not that enjoyable because she has fabric all over the place, just shoved into huge bags. If she could sort it out like you do, she’d do so much better.